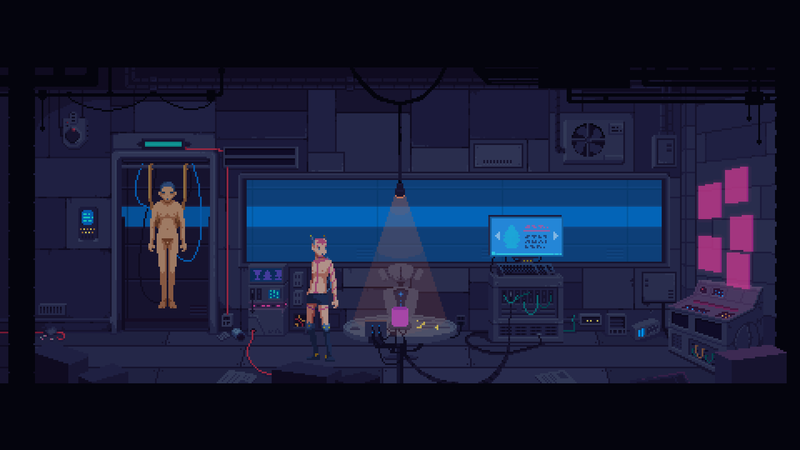 The Red Strings Club did an excellent job at playing with my expectations in regards to just how an adventure game can deliver a compelling, multifaceted story set in a cyberpunk backdrop during my first time playing it. In a far-flung future, a mega corporation is about to introduce a technology aimed at forcibly introducing pure happiness in the minds of the world’s population that has grown to depend on implants in order to live. The Red Strings Club deals with issues like transhumanism, sexuality, and human behavior in an engaging way that never feels blatant or forced, but quite naturally, all the while asking you deep and thought-provoking questions that video games rarely do. 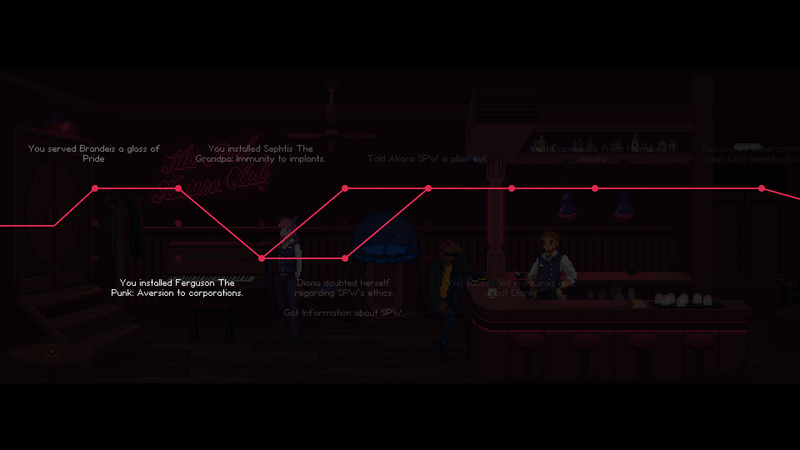 That said, the plot that moves The Red Strings Club is an even more complex web. It’s slowly untangled with each drink that is prepared by one of its protagonists, a barman and information broker named Donovan. He has the unique ability to tune each of his creations to the mood of his clientele, unlocking secrets that in turn serve fuel his information network, which he runs directly from his bar. It might sound gimmicky, but every conversation that Donovan has with a client turns out to be gripping, thanks to some witty and intelligent writing. These chats are fueled by the alcohol that’s prepared via a simple, yet somewhat demanding, mixing puzzle game in which various different types of beverages are mixed in order to precisely align a circle around particular emotions and moods suited to move things along. The drink mixing minigame works somewhat well, and helps avoid making The Red Strings Club feel as straightforward as it could’ve been otherwise. Given that its narrative crossroads are limited to three or more choices each time, the weight of the consequences of your choices feels surprisingly heavy and with with sometimes immediate effects. While some of these are obviously tied to later game events, a lot of the effects are instant and hit you hard and unexpectedly, such as one of the intro moments where a chip-welding android is hacked and you’re given control as to which personality-altering implant to shape and use on one of the mega-corporation’s customers. And then there are moments like when Donovan’s hacker friend Brandeis (The Red Strings Club’s second playable protagonist) hacks into an android that just happens to fall into the bar and turns her into the bar’s greeter, Akara-184, that alongside the dialogue, help provide a lot of quality character development. These sequences are especially impressive considering how small Deconstructeam’s three person group is. The Red Strings Club’s presentation is another one of its highlights, thanks to beautiful 16-bit like pixel art that animates incredibly smoothly and works wonders to set in the mood in conjunction with the gloriously pixelated but still pretty darn detailed backgrounds. The music never gets in the way, either, which is something that other games set in similar settings tend to go overboard with. It’s only during one particular segment that music is directly acknowledged as an in-game element, working as something of a distraction while doing seemingly menial work. There have been few games that have touched this kind of subject matter with the same kind of naturality that The Red Strings Club does so well. It’s by no means a perfect game. The drink mixing game can get repetitive and a little finicky, and the lack of any sort of save feature for your previous decisions’ graph when starting a new playthrough — like in Nine Hours, Nine Persons, Nine Doors — is kind of baffling. Still, as a work of fiction that deals with real world issues, it does so in a way that makes it a must play for just about anyone looking to enjoy a great story.